On a sultry Friday evening in late September, eleven of us gathered at the Ship Inn in Port Eynon at the start of a Gower Peninsular walking weekend. It was remarkably warm and we were able to sit outside and enjoy the fine food and ale on offer. During the evening we watched many new arrivals having journeyed from afar at the end of the working week. There was excitement in the air as, on Saturday, it was the Port Eynon triathlon and many of those arriving were lean looking. 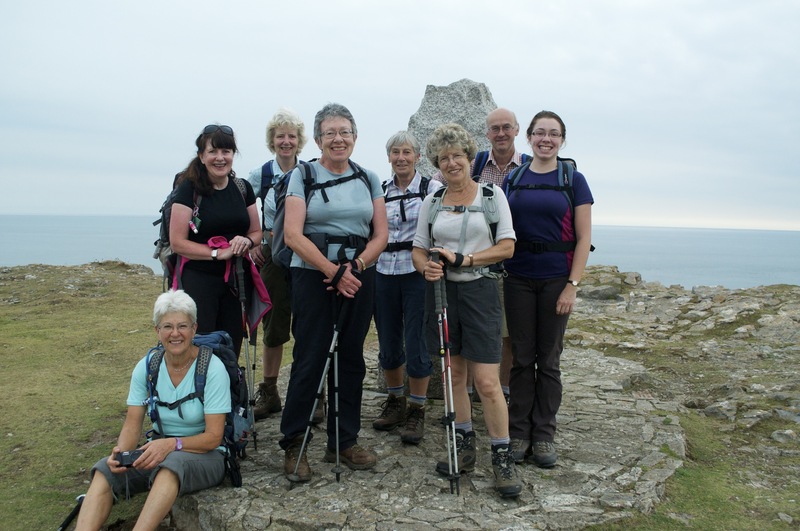 I seem to be following these events – last weekend it was Snowdon, this Port Eynon! We were staying in Port Eynon youth hostel, a converted former lifeboat station, understandably right on the edge of the shore. The old boat house is now the dining room with wonderful views down the ramp and out across Port Eynon Bay. The ladies in the group had the room above giving a slightly elevated outlook. Although the morning dawned cloudy and grey, it was warm and dry. The forecast looked good but it was likely to stay overcast for the majority of the day. During breakfast at the hostel there was much activity on the beach and in the bay. Canoeists were positioned in a line along the course to two large, orange buoys, where the swim was to take place, and swimmers were gathering at the water’s edge. The sound of a horn heralded the start and, maybe, up to 200 competitors, surged forward turning the still water into turbulent action. My admiration for the spectacle soon turned to concern when it occurred to me that the transition from swim to bike was at the end of the lane leading from the hostel and we might have difficulty getting out. I wandered down to have a chat with a steward to see what were the prospects of escaping. By now the quickest of the swimmers were emerging from the water and transferring to their bikes. The steward, who seemed to have most control, was the one ensuring the cyclists did not mount before a red line across the road. It was worth being there just to listen to her words of encouragement. All competitors were treated to,”Come on my lovely!” in that delightful Welsh accent, which assured you that she meant it every time. The outcome of my conversation was that it would be best if we could delay until after the fancy dress swimmers had gone through the transition by 9.30 at the latest. This was going to delay us but not really cause us any inconvenience. 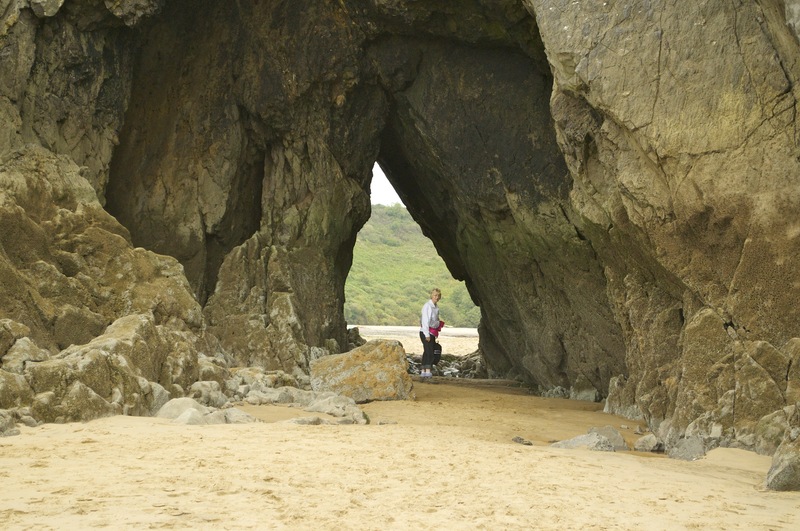 Having escaped in three cars we drove east, towards Swansea, turning off to Caswell Bay, a pretty inlet to the west of Mumbles Head and right on the edge of the sprawling suburbs of Swansea. There is a whole network of paths criss-crossing their way along the cliff edge and it was sometimes difficult to determine which was the right path to take but we generally got it right and made steady progress towards our designated coffee stop at West Cliff. The path had so far taken us along the cliff edge, through coastal woodland, which I always find unique among woodlands. The trees are rarely huge and the on-shore winds have shaped them and moulded them into, often, life-like creatures with flailing arms that come to life at night. Between the trees we had vistas of hidden coves, sandy beaches and blue sea, still blue despite the greyness of the day. 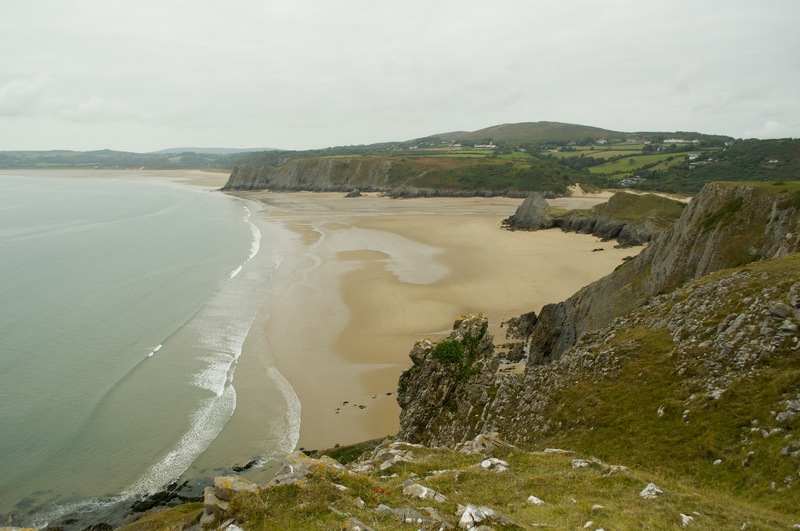 Following coffee, we were heading to what I consider to be one of the most beautiful parts of the Gower Peninsular, Three Cliffs Bay. Half an hour walking along the cliff top brought us to a sandy descent to the beach, quite extensive now as the tide was nearing its lowest point. When the tide is in it covers virtually the whole of the beach, so the sand is firm, golden and clean. Perched on barnacled rocks at the foot of the cliffs and adjacent to the dramatic arch cutting through to another section of beach, we had lunch. It never ceases to amaze me how quiet this beautiful beach is. A few families were dotted about and some climbers were tackling the cliffs. It is a large expanse, which takes a little effort to get to and thus tends to be fairly quiet. Low tide meant that we could take a short cut across the much wider sands of Oxwich Bay towards Oxwich Point, to emerge on to the land at the Oxwich Bay Hotel, a distance of about 4km. It was a perfect opportunity to de-boot and walk in the still warm waters. Not many took this opportunity, fearing sand chaffing the feet on the latter stages of the day’s walk. Towards the western end of the beach we came across a group of young Chinese armed with spades and buckets, not for making sandcastles, but hunting for razor clams. They disturbed the surface with the spades and watched for bubbles rising out of the wet sand. Whenever they spotted any they became excited and, probing further, pulled out large razor clams, which would end up on a dinner plate that evening. On reaching the Oxwich Bay Hotel it was time for a cup of tea before the steep climb up through the woods to Oxwich Point. Whilst the climb is not particularly long, it is steep, and in the balmy conditions we were experiencing, it was hot work with sweat pouring freely. Emerging from the trees and rounding the point we could see Port Eynon, the end was in sight. Below us, on the rocks exposed by low tide, a lone fisherman was walking back to Oxwich with a large fish in his hand; clearly his supper for the evening. 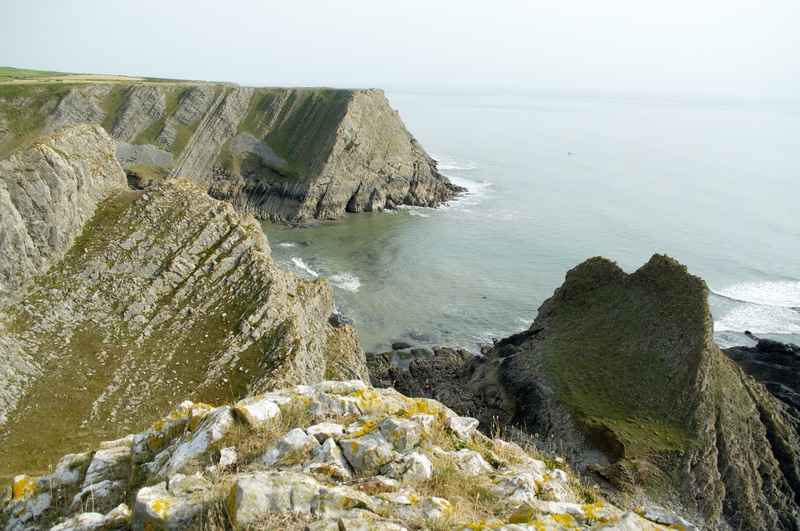 The path now was wide, grassy and relatively flat, following the line between two cliffs, an ancient higher one and a geologically much younger one between us and the sea. The youth of this cliff was clearly apparent in places as there were fresh landslides, one of which we had to make a significant detour for. The path eventually emerged on to the beach at Horton and we were able to take a direct line across it to the youth hostel. Our late start meant that we finished rather later than I had intended but it did not matter as our only plan, after retrieving the cars, was to eat at the Ship Inn again. The pub was heaving, not with lean triathletes (they had all gone home), but with locals. Our food took some time to come but it was worth the wait. The Ship Inn is a goldmine; it has all the ingredients for success, a good menu, a variety of quality drinks, space to accommodate a lot of people, and very little local competition. I highly recommend it if you are in the area. Sunday dawned bright and sunny. Instead of staying in the hostel I had camped in the field next door and the clearing overnight skies allowed the dew to settle. On saturday morning my tent, the grass and my car were bone dry. Today, we had no excuses to delay our start so we shuffled some vehicles and the group to Llanmadoc, only to find that, it too, was busy as it was the Llanmadoc Run. Cars were queuing to get into the small car park and inside it was full of activity. The participants weren’t as lean, or mean, as the triathletes of yesterday but there was an air of amateurish enthusiasm, apart from the cool chap parked next to me who sat on the tail gate of his pick-up drinking a cup of coffee. 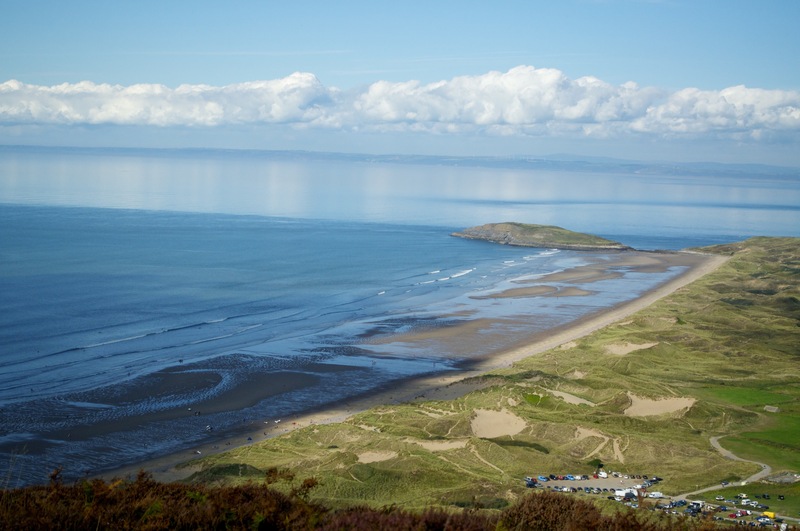 Leaving the beautiful village of Llanmadoc behind we climbed immediately up the bracken covered slopes of Llanmadoc Hill. 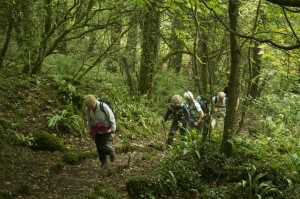 Through the bracken a narrow path led the way but there were many others criss-crossing the hillside. The sun glistened on the dewy cobwebs straddling the path and it was a shame that I had to undo all the hard work the spiders had done to build their traps. Crane flies disturbed by our passage fluttered about our legs. It was a stunning morning, the view from the summit down to the mud flats of the River Loughor with Llanelli beyond was stunning. 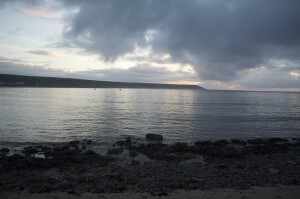 A layer of non-threatening cloud hung over the shore to the north and was reflected in the flat waters of the sea, giving the appearance of a shimmering mist. There was no need to rush as we enjoyed the warmth and the views in all directions. 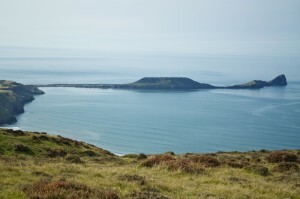 Descending to Llangenith, we picked our way through fields to the foot of the northern end of Rhossili Down. 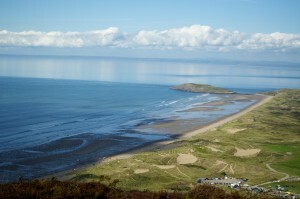 As we climbed the steep slope the splendour of Rhossili Beach and bay came into view, the outgoing tide leaving behind a pristine beach of smooth, golden sand. The view was only blighted by the regimented rows of static caravans at the northern end. This more accessible end was busier with surfers riding the waves, while the southern end was virtually deserted. Once up on the downs it was an undulating path along the ridge, now with views inland as well as those out to sea. 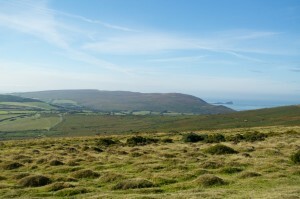 The inland views are not unattractive but they lack the grandeur of the coastal views. There are very few trees inland, farmers making the most out of the land they have. The concrete remains of a radar station sit in a hollow just below the ridge, built to track potential German bombers and shipping heading for Milford Haven during the war. Having fulfilled its purpose, it was dismantled in 1946, leaving just the concrete foundations. Wild horses populate the hillsides today. 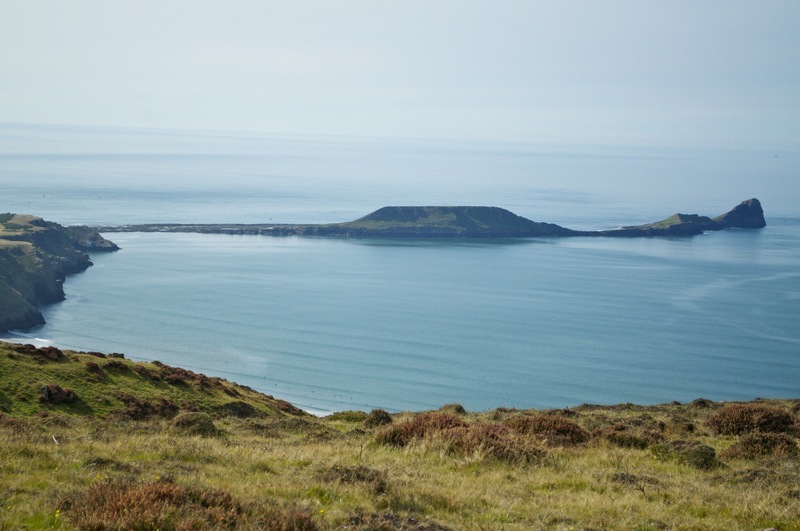 Rhossili is only a small village but it attracts a significant number of tourists, many of who do not venture down to the beach but frequent the Worm’s Head Hotel, offering fabulous views as well as food and drink. 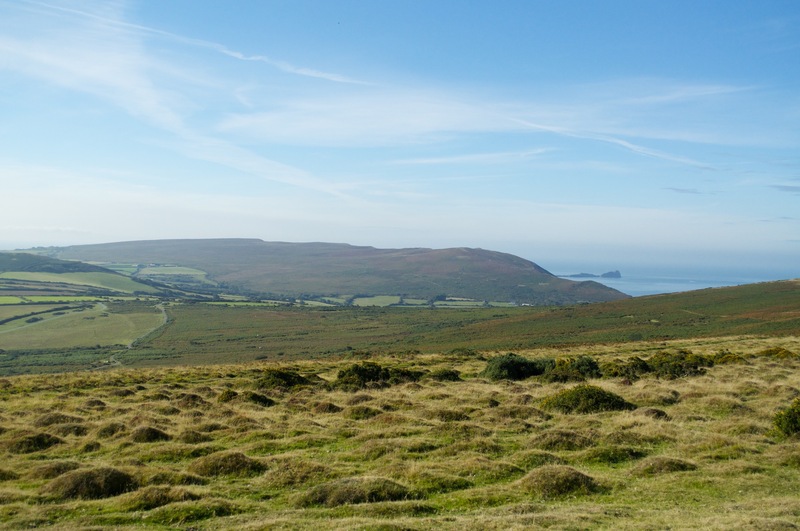 Many walk the short distance to the information point overlooking the interestingly shaped Worm’s Head jutting out to sea. We didn’t have time to venture out on to the headland despite the tide being in favour of doing so. 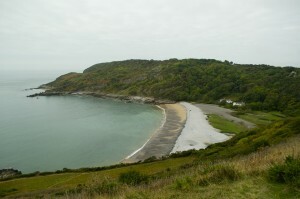 Rounding the point, we now had a few miles of fairly flat cliff top walking to do to take us back to Port Eynon. Every-so-often we would cross the head of a small bay or inlet with a path enticing us down to the water, but we resisted on this occasion. It may well be worth returning to give these deserted coves and inlets more attention in future. 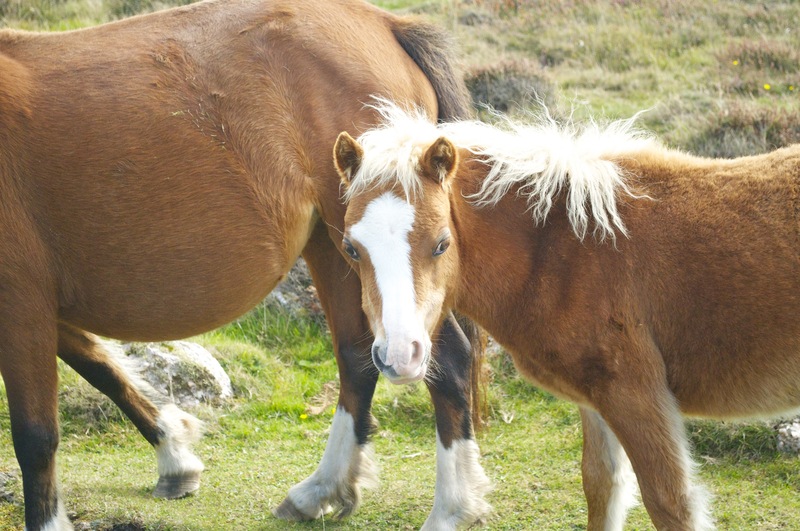 Some of them have very evocative names, conjuring up images of smugglers; names like ‘Deborah’s Hole’, ‘Blackhole Gut’, ‘The Knave’ and ‘Horse Cliff’ to name four. These are all accessible on the internet but it might be best just to let the imagination take control and not look too deeply into their meanings. Soon we rounded the headland of Port Eynon Point and the youth hostel came into view. We finished on a still balmy late September day. We had not only been very lucky with the weather but the youth hostel provided perfect accommodation and Port Eynon was perfectly placed for our activities of the weekend. 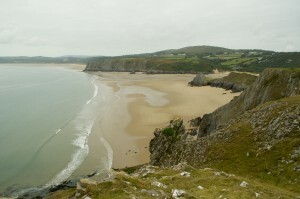 We left with every reason to return one day for more exploration of the Gower Peninsular. This entry was posted in Gower Peninsular, News by jwalton. Bookmark the permalink.